When we began the Local Entrepreneur Forum in 2012, we were inspired by the idea that if we created a space for creative change makers, social and green entrepreneurs, catalysts and enablers, investors and other supporters, something good would happen. It did. We have discovered that it forms the heart of a new model of community-led economic development – one that’s inclusive, fair, regenerative, resilient and accountable. Remember the great Blizzards of March and how everyone in the town came together to help one another? The Community of Dragons is not so different. Every year, ordinary members of the community – people just like you and me – get together to support our friends and neighbours to start and grow enterprises that benefit our community. Come along and ‘invest’ money, expertise, neighbourliness and hugs to support your favourite local enterprise. Last year, over 60 offers of support were promised to 4 enterprises. This year…? Who’s pitching? Four fabulous local enterprises doing good! Nourishing Families – nourishingfamilies.co.uk – A social enterprise in the making, Nourishing Families is dedicated to supporting parents and children get maximum benefit and enjoyment from food and meals times. Our mission is to connect women who are looking for opportunities to change their lives, and the world around them, with women who can help them to achieve their goals. Contact us at reconomycentre@gmail.com for more info. Thursday April 19, 5:50pm – 9pm – done and dusted! It was a great evening. Have you seen Dragons’ Den on TV? The Totnes version is different – everyone’s a dragon! Come along and ‘invest’ money, expertise, neighbourliness and hugs to support your favourite local enterprise. Last year, over 60 offers of support were promised to 4 enterprises. This year…? We’ve just selected the five projects that are going to pitch to the Community of Dragons! They are launching, growing, looking for financial and/or non-financial ‘investment’. And they are awesome! The Woodland Presents – Al Tempest – We’re here to make small British woodlands thrive, by connecting people with trees and timber in new and meaningful ways. We run a maker-space, courses, events and a community woodland group in Dartington, South Devon. Black Bee Coombe – Emily Read – Re-establishing locally adapted “black” native honeybees in South Devon. Offering bees a natural lifestyle in free-living tree-inspired hives. Yew Media – Jay Jacoby – We help people create beautiful legacy stories for the ones they will leave behind. We do this by creating safe spaces for people to tall their stories, which we turn into video and audio. Studio 45 a Creative Pottery Hub – Richenda Macgregor – Studio 45 is an interactive learning facility with a full programme of courses and workshops and offering places for 15 budding potters wanting to further their practice. The facility will have 8 wheels and three kilns and will have a research arm, investigating the clays and materials found on or near to the Dartington Estate. Huxham’s Cross Biodynamic Farm – Bob Mehew – We’re innovative food producers, pushing the boundaries of what is possible on a small scale. Using permaculture, biodynamics and agroforestry. We grow wheat for flour, dried beans for Grown in Totnes, unusual (and usual) fruit and vegetables, eggs that are selling out every week, supplying our Local Round customers, The Almond Thief, Dartington’s new Green Table Cafe and Schumacher College. And we offer a Wellbeing Programme! We’ll have the witty and wonderful Katie Tokus hosting an evening full of laughs, love and celebration as we all come togther as friendly ‘Dragons’ to invest our support with our local entrepreneurs. There will be lots of productive networking, too, so local enterprisers, consultants, experts, investors – don’t miss this opportunity to get to know one another in a relaxed and fun atmosphere. Present your project idea to a small group of friendly faces. Teams of local designers, business heads and creative problem solvers apply their collective genius, working with you to make it real. Maybe even get it ready to pitch to the Community of Dragons! It’s that simple. 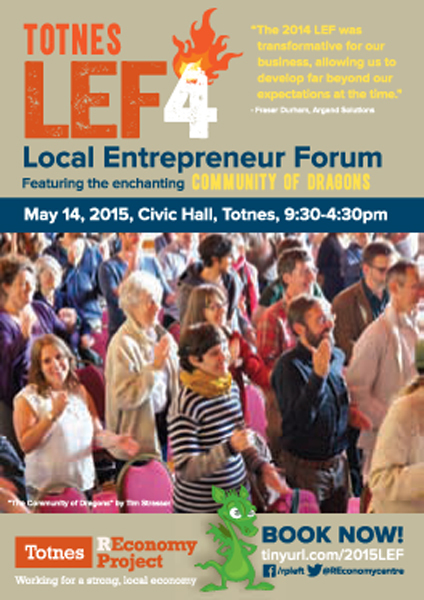 ** LEF5 May 12th 2016, Totnes Civic Hall ** for a re-cap of what happened, check out this article: “Community of Dragons Spreads the Wealth”. inspiring talk – perhaps offering a glimpse into the emerging new vision for Dartington. Four of our past Community of Dragons pitcher are enterprises located on the estate – GroCycle, School Farm CSA, The Living Projects, and Green Funeral Company. Who’s next? Be Like a Bee – Super fun and super productive. Share needs and offers. Meet people you need to meet. Learn what you need to learn. A most important part of the day. It’s ‘open space’ but a few pre-organised sessions will be announced, soon. Delicious local supper included, prepared by The Kitchen Table. And through the afternoon, they’ll have the cafe running, offering a variety of baked morsels, tea and coffee. Meanwhile, the über green Bean Bug will be serving espresso drinks from their pedal-powered mobile cafe. And our favourite craft brewer, New Lion Brewery will open the taps. Will Circular Stout make a comeback? The Oat Mild? You’ll have to come and find out. Our evening keynote – we are really pleased to welcome activist and entrepreneur, Jonny Gordon-Farleigh. He founded Stir To Action, a Bridport-based enterprise, while in his 20s. It runs workshops and short courses on the new economy, and supports new start-ups through crowdfunding, project planning and legal registration. 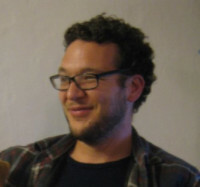 He is also founding editor of STIR magazine, a quarterly promoting community-led change. He speaks on the new economy and is a founding member of the Young Co-operators Network. The Community of Dragons – Everyone is welcome to become a community dragon. Everyone can be an investor. Regular people – just like you and me – can invest their financial resources, skills, time, connections and caring to support the kinds of enterprises we want to see in our community. It’s that simple. And who’s pitching for local support and investment? LEF5 After Party – we’re really pleased to have New Lion Brewery offering their craft brew again, this year. And a very special treat – Sea Change Festival DJ Set by Drift Records. The Sea Change is an amazing new Totnes event launching in August – films, literature, talks and plenty of music across five venues. … 10pm and we’re outta here, a littler wealthier, a little wiser. A huge thank you to Reconnect Magazine, who has been generously supporting the LEF and local entrepreneurs since 2012. Once again, the Local Entrepreneur Forum, held this past May 2015, was a fantastically full day. We hope you came away with the knowledge you looking for, met the people you wanted to meet, and connected in ways that support you now and in the future. We’ve collected below some of the outputs and other information from the day to help you keep the momentum. – the Totnes REconomy Project team. The fabulous pitchers: Our pitchers were great, weren’t they? 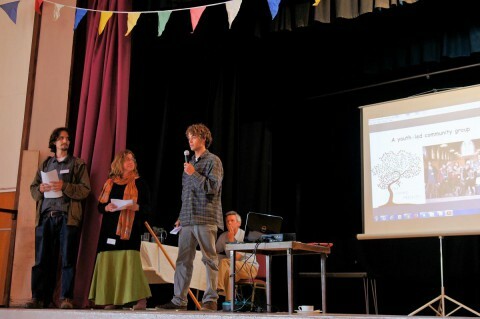 8:30am Breakfast Club – hosted by Grown in Totnes, who pitched at LEF3. Enjoy a hearty, stick to your ribs oat-filled breaky – only £2. The Bank of Devon? – Tony Greenham, new economics foundation – what would it mean to have a regional bank serving the interests of the community and how do we make it happen? An inspiring proposal. Crowdfunding the Future – Oana Neumayer, BuzzBnk Our good friends BuzzBnk are hosting the crowdfunding campaign for Grown in Totnes. 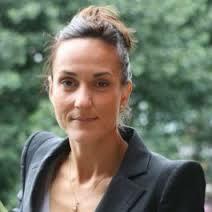 Oana will talk about how crowdfunding is powering the rising ‘for community benefit’ economy. REconomy all over the world – Fiona Ward, REconomy Project Many innovations start in Totnes, it seems. Other local ‘REconomy Projects’, just like in Totnes, are popping up all over the world, from Japan to the US to Brazil to Portugal to Sweden – you get the idea. – Sources of Finance – Fraser Durham will share his research on close to 300 sources of finance for social/sustainable/community enterprises. – Atmos Totnes – Want to locate your business at Atmos? Come meet Atmos reps who will be ready to discuss the possibilities. Is Alternative, Democratic, Community Finance Possible? – Organisers of TRESOC, Transition Homes, and Plough & Share share their stories of challenge and success. 4:00pm After party, hosted by New Lion Brewery, who pitched at LEF1, featuring a special craft brew. This year’s Local Entrepreneur Forum on May 13th was a massive success. A big thank you to all who participated! Over 130 entrepreneurs and their supporters converged on the Civic Hall for a full day of networking, learning and investing, with five plucky entrepreneurs walking away with pledges of funding, mentoring, labour, legal and marketing services, massage training, event organising, and even home-cooked meals. A TTT project that seeks to broaden the range of local produce grown and sold in the local area. It’s all starting with oats! We are working with a local farmer, to develop a market for Totnes grown and processed oats. Oats grow very well in our damp climate but there is currently nowhere that you can buy oats that are both grown and processed in the South West. ‘Dart Valley Timber’ is a (new) mobile sawmilling operation, suited to(or designed for) the timber available in the area. It can cut to order but will also dry and season timber, meeting the demands of local natural builders, woodworkers and craftspeople. And supply some really good firewood! Every Drop makes a Difference! Support truly sustainable British Woodland Regeneration on Dartmoor, by harnessing energy from the river to add value to timber, provide educational opportunities, and help realise a fossil fuel free forestry & farming future at The Hillyfield. Argand Solutions is a solutions-led energy monitoring business based in Totnes. We design and build solutions that enable commercial & industrial clients to reduce energy consumption and generate energy more effectively through smart data visualisation & analysis. The Living Projects is a youth-led initiative blazing a trail to find innovative ways to help young people access land, housing, real-life skills and purposeful work. We want to help make Totnes a town where young people have opportunities, can afford to live here, and are supported and inspired by the people in their lives. Our vision is opening up town and land-based community space, facilitating young people’s initiative to create viable and sustainable futures for themselves and their communities, and unleashing their creativity, talents and dreams along the way. Read about the 2013 event in Rob Hopkins blog and check out what participants said in this video. TotnesArts Hub – It’s a cooperative seeking to establish a work hub for artists and makers, including studios, workshops and messy space. Totnes Mosaic – Mosaic aims to bring a flexible, playful, multi-use space to Totnes High St, hosting educational projects and live performance in a fresh, urban setting. Eat, drink and buy local or hold your own event and be part of the Mosaic. Babes in the Woods – Hen parties in the wilds of Devon. The Land Society – We support people in housing need in towns and villages to self build their own affordable home.